Hydropower, or hydroelectric power, is power generated by the force of moving water, and makes up the vast majority of the United States’ current renewable energy power generation (66% of renewable energy and 6% of all electricity). 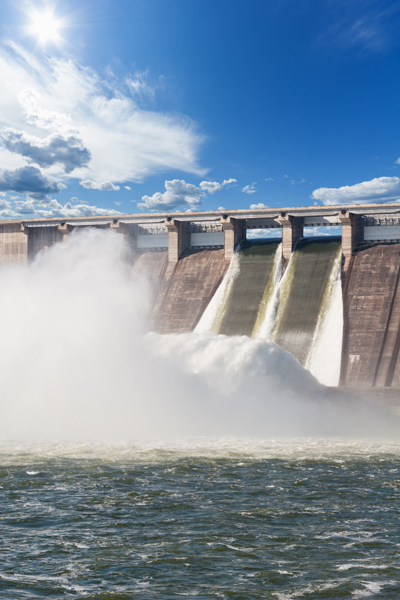 Hydropower is driven by the water cycle, with solar energy driving evaporation, condensation, and gravity providing the renewable energy source. Learn more about hydropower from the Department of Energy. Do you have a hydropower resource flowing across your property? You can use the calculator below to estimate your potential power output! Impoundment Based: The largest scale of hydropower production is from an impoundment, or dam. Impoundment hydropower operates by creating a reservoir behind a river dam and channeling water through the dam itself to the river below. As water flows through the impoundment, it turns turbines that generate electricity. Wyoming has numerous large-scale impoundment based hydroelectric facilities, such as Seminoe or Buffalo Bill dams. For more general information on impoundment facilities, visit the Bureau of Reclamation webpage. For information on Wyoming projects specifically, visit the Wyoming Geologic Surveypage dedicated to projects in Wyoming. Diversion: Another large scale hydropower production method is diversion hydropower, which diverts – sometimes with the use of an impoundment – a channel of a larger river through a canal or penstock. As the water moves through the diversion, it turns turbines to generate electricity. As most Wyomingites will not be building a new Hoover Dam, micro hydropower is the most suitable for individual or community use. In this type of project, water is channeled through a penstock, or pipe, where it flows around a turbine that is attached to a generator. Water is typically funneled to the powerhouse where the turbine and generator are located from a canal located above the powerhouse. Learn more about micro hydropower from the Department of Energy. Many communities, rural electric cooperatives, and irrigation districts are using small hydropower projects to expand their renewable energy portfolio, find out how with University of Wyoming Extension, Sustainable Management of Rangeland Resources video on small hydropower systems. Where can micro hydro power be used in Wyoming? Micro/small hydropower can theoretically be used in Wyoming wherever flow and head are adequate . As using in-stream water flows can necessitate lengthy environmental and/or water rights reviews, one logical place for micro hydro installations is in existing irrigation/municipal water canals, dam, and diversions. The equipment can either be owned by individuals or an irrigation district. The Idaho National Lab’s Virtual Hydro Prospector provides a tool for locating and assessing water energy resources in the United States. Micro hydropower systems are eligible for many of the same federal and state incentives as other renewable energy sources. Please visit our Incentives page for more information. Are there many micro or small hydropower systems in Wyoming? There are numerous facilities, such as the Strawberry Creek project controlled by Lower Valley Energy. [/toggle][toggle title=”Are there many regulations?”]To harness hydropower, a landowner must also have the right to use the water as managed by the State of Wyoming. In addition, the Federal Energy Regulatory Commission (FERC) must license or grant an exemption to all grid connected facilities. Where can I find a contractor or technical assistance? As micro/small hydropower opportunities are not as common as other renewable energy, there are fewer readily available resources to assist you. A good place to start is by contacting the Cooperative Extension Service. Other useful resources are provided by the National Sustainable Agriculture Information Service.